Jose and Linda Garcia live and breathe Latino art, culture, and history, devoting much of their lives to researching, collecting, exhibiting, and preserving it. This Omaha couple embody a passion and magnificent obsession in what they do. The following cover story for the New Horizons keys off their most ambitious program to date, a month-long celebration of the Day of the Dead or Dia de los Muertos that they’re calling Music to My Bones. Jose Francisco Garcia and Linda Garcia are one of those meant-to-be couples you rarely meet in real life. They’ve very different people in some ways and clealry alike in others but what they have at their core is an abiding respect and appreciation for each other. These retirees are two of the busiest people you’ll ever know. They immerse themselves in community activities that seek to enrich, educate and entertain. Both bring diverse experiences and gifts to their relationship and to their community-centered work. Jose, 67, has business and organizational acumen from his years as an activist, program developer and corporate officer. He also brings a certain discipline from his stint in the U.S. Army. Linda, 66, is a artist, storyteller, teacher and former children’s librarian, with a fine aesthetic sensibility and keen intuition. He’s the fly-in-the-ointment agitator. She’s the smooth-everything-over nurturer. Though he says he’s a loner by nature, he doesn’t mind public displays and isn’t shy about promoting himself or Linda or their work. That’s not the case with her. You won’t find the many awards she’s been honored with displayed in their home. The multimedia artist works with lots of recycled materials, including cardboard and paper, to create sculptures, cutouts, toys and dolls. “The real world means nothing to her” in those creative reveries, says Jose, who credits whatever aesthetic awareness he’s gained to her. Each is knowledgable and passionate about the art, culture and history of their shared Chicano roots. They’ve spent countless hours studying Mexican art, traveling to exhibitions, workshops, conferences. For decades they’ve collected Mexican art objects and materials and shared them with the public. “We’re Chicanos. What we do is we share art history and culture – that’s what Chicanos do and we’ve lived by that credo,” says Jose. Their largest scale event to date is Music to My Bones, an exhibition and celebration of Dia de los Muertos or The Day of the Dead that runs October 6 through November 12 at the Bancroft Street Market in South Omaha. In addition to displaying original artwork by contemporary artists from the metro and Mexico the multimedia event features art presentations, art classes and live music and dance performances. The exhibit is dedicated to the memories of Isabel “Chavela” Gonzales Hernandez and the Barrientos brothers – Vidal, Juan and Panfilo – and their musical contributions to the community. Linda’s designed a large music ofrenda installation in honor of those two families and other Latino artists. “We want it to be multidimensional for people who honestly want to know the tradition and culture of Dia de los Muertos.” says Jose. “We’ll have everything from ofrendas to presentations to kiosks to musical groups. We want to blanket it as best we can. And we have so much material we can put into action. It’s going to be relevant and traditional and not made up. The art’s going to be primo. Among the featured artists she’s adopted is Bart Vargas, who’s come to appreciate what she and Jose contribute to artists like himself. Much as the Garcias collect art, they collect artists, whom they work with over and over again. The exhibits the couple curate flow from their collection, which they began accumulating shortly after marrying in 1977. “She didn’t become a material collector until I come around,” Jose says of Linda. “She was a spiritual collector. Everything was here,” he says, indicating her head. Many of their acquisitions come from trips they’ve made to their ancestral homeland. They’ve now amassed private holdings that would be the envy of any museum. Their multi-story Bemis Park neighborhood home, whose oak-finished interior is in the Craftsman style, is filled with art and artifacts from basement to attic. Off-site storage units contain the rest. At one point they did operate the Las Artes Cultural Center in South Omaha as a venue for showing some of their vast Mexican wares. More recently they formed the Mexican American Historical Society of the Midlands as a kind of extension of their collection. They now serve on the board of the organization, for whom they curate exhibitions and programs. They often dip into their collection for presentations and workshops. Linda is an artist for the Nebraska Arts Council Artist in Schools and Communities residency program. 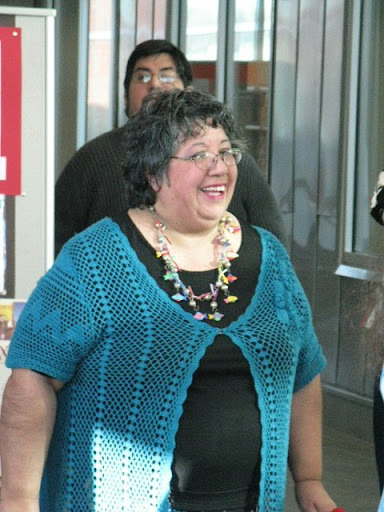 She just finished a three-month summer residency at the Omaha South Branch Library, where she taught Mexican folk arts. She covered repujado (metal embossing), pinturas de amate (bark painting), nichos (Mexican decorative boxes), papel picado (Mexican paper cutting art), pinata making, printmaking and yarn painting of the indigenous Huichols and wood carving and painting of the indigenous Oaxaca people. Maria Teresa Gaston, emeritus director of the Center for Service and Justice at Creighton University, has had the pleasure of being taught by Linda. “One of my favorite experiences with Linda was attending an art workshop she led when she and Jose had Las Artes. She taught us how to make Mexican-styled cut metal ornaments from soda cans. I loved being in her presence and being led to connect with ancient traditions and release my own creative spirit. I have often thought of that Saturday morning and longed for more of that mentoring. Gaston’s also enjoyed Garcia’s storytelling talent. Linda also teaches at Granville Villa Retirement Center, the South Omaha Boys and Girls Club, the Joslyn Art Museum and other sites. Whatever the program or subject or theme, the Garcias likely have a ready archive or reference or example at hand to give the project depth or perspective. If they don’t have what they need themselves, they get it. Their teaching and research often lead to new collecting interests. For example, as soon as the couple began teaching about Oaxacan wood carvings, Jose says they had to have them, and so they collected them. “Now we own about 15 Oaxacan wood carving objects. Thats’ the story of our lives.” Thus, the collection ever expands as they add new elements. Their hard cover book collection alone numbers in the thousands. Linda’s not alone in presenting the material. Jose, a trustee with the Nebraska State Historical Society and a former Douglas County Historical Society board member, also does his share of presenting and teaching. Gaston can attest to his ability to hold an audience. Jose has also taken it upon himself to document Omaha Latino life through photographs. He makes a point of showing up and snapping pics, these days mostly with a digital camera, at countless community events. He posts the images to his Picasa web albums on Google-Plus. Sometimes his photos are published in El Perico and other local publications. “You can call him a community photographer,” says Linda. He also searches out documents and photos that illustrate the long, rich history and culture of Latino Omaha. Just one of his discoveries is an original framed poster printed in Spanish promoting a 1935 Cinco de Mayo celebration in Omaha. The event was sponsored by the Sociedad Mutualista Mexicana or Mexican Mutual Aid Society, founded in 1928. He says the society operated a school called Lazaro de Cardenas, where English was taught to Mexican immigrants, and took a census. He says most of the local Mexican population then was based in South Omaha. The railroads and packinghouses were their main employers. Both Garcias are on the Speakers Bureau for the Nebraska Humanities Council. She’s a storyteller with NHC’s Prime Time Family Reading program at the South Branch Library. Because of the amount of material in the Garcias’ possession, ranging from sculpture to fabric to paper objects to books, only a fraction can be displayed at any given time. So they bring out small selections to present with their talks and programs, et cetera. “We don’t have a gallery, so our gallery is the community,” says Jose, and for Music to My Bones their gallery is the Bancroft Street Market. These life partners enjoy collaborating on projects. Linda admires his tell-it-like-it-is style. “You may not like what he says but he speaks up and says it in front of you. One thing I really learned from Jose is to speak out and not be this timid girl. I saw the respect people would give him because he would ask for what he wanted. Jose, who grew up in Kansas City, Mo. and lost his mother at age 6, lived a kind of vagabond life until he wound up in Omaha and met Linda. He was going through a divorce at the time and he and Linda were just friends at first before becoming serious. He appreciates what he found in her. The couple have two grown sons, Che and Carlos Garcia, and two granddaughters, London and Elliette. One of the key things that brought them together in the first place and that keeps them together after 35 years is their shared Chicanoness. They both got caught up in the Chicano Movement of the 1960s and 1970s and for them the movement’s aim of empowering and immersing U.S. citizens of Mexican descent in the richness of their shared heritage has never ended. Indeed, the Garcias have devoted their retired years – she’s a former Omaha Public Library children’s librarian and he’s an ex-Union Pacific Railroad officer – to preserving and displaying their heritage. It drove Jose to find himself. He served one tour in Vietnam with an engineer battalion operating in and around a support base, Dong Tam, near the city of My Tho. He was apolitical entering the service but he came out highly politicized. Back home he not only joined the antiwar effort he intersected with the burgeoning Chicano Movement. Much of his activism centered around the two colleges he attended in his native Kansas City. At Penn Valley Metropolitan Community College, he says, “I connected with every radical group on the face of the planet, including the Weathermen, SNCC (Student Nonviolent Coordinating Committee), the Brown Berets, the Black Panthers. Always a loner, I gathered my causes in a singular manner and marched as they say to my own drums. After a stint on the student council, I organized Libra, an alternate bookstore. After getting his bachelor’s degree from UMKC he worked as a program developer with the Kansas Council of Low Income Peoples and Migrant Workers in Garden City, Kansas. He made several trips to D.C. to negotiate proposals for housing and health services. Before coming to Omaha in 1976 he married and worked a series of jobs. He was employed at Xerox, twice, he became a hypnotist helping people lose weight and reduce stress,, he sold cemetery lots, he sold Kirby vacuum cleaners door to door, he even picked apples one harvest season in Kansas. He eventually got on with the Chicago Northwestern Railroad as a clerk and worked his way up to training personnel. The railroad was purchased by Union Pacific and years later he took his buy out from them. Among his early Omaha gigs was serving as director of the Chicano Awareness Center. It’s where he met Linda, who was already active in the organization. Omaha Latino activist Abelardo Hernandez says then as now Jose and Linda were a force to be reckoned with. “She helped us with our art classes and later joined us in our folkloric dance troupe. She sacrificed a lot of her time to help the young kids understand the arts and traditions of our people. Linda has never let up in our struggle for knowledge. When it came to relationships, Linda says she was dead set against marriage and had a whole rationale worked out to justify her attitude. She began warming however to this newcomer. He intrigued her. Just as Jose did, underwent her own identity catharsis. “When I went to Mexico my senior year at College of St. Mary I came back very disappointed knowing I had taken four years of art history and the only time anything Mexican was mentioned was one period, and it was just four muralists, and they were all male,” she recalls. Mexico opened a whole new world to her she was eager to explore. She was enthralled by the handmade art, some of the techniques going back centuries, she came upon. Then there was all the history she discovered. “It hit me really hard when I came back. First, it was a cultural shock. It was like, ‘Why didn’t anybody ever tell me this?’ And the answer was because it wasn’t up to them to tell you in any way, it’s up to you. But how do you know to look? “I just became really hungry for getting my hands on this and the Chicano movement. It was like an awakening. That happened to a lot of people. What was awakened was the art, literature, of becoming who you are as a Chicano. I’m not really Mexican, I’m an American, but the combination made me a Chicana, which means I seek knowledge, but it’s not enough to stop there, you must transmit it to other people and share it. In other words, be a teacher. “It’s not enough to collect and learn and keep it all to ourselves. Thats’ the reason for this place,” she says, referreing the Mexican American Historical Society. It’s the reason for Music to My Bones. “It is stuff to people, it’s more than that to us. It’s more than leaving things to people, it’s leaving the story. Without the story it’s absolutely meaningless. There’s also the matter of leaving and passing on a legacy. “I think everybody wants to do that in a way – to say, ‘I was here, I want to leave a mark.’ Like with the Day of the Dead they say there’s three deaths: the first death is the physical and then when you’re buried and nobody can see you, but the worst death is to be forgotten. Their work is far from done in their estimation. They’d like to form a free research and public library containing their catalogued and digitized collection. They’d like to have a permanent exhibition space. “We don’t have a million dollars but were Chicanos, we’re going to do what we have to do to get it done.,” says Jose. And these two will do it together as long as they can. “We’ve become two old souls together,” he says. For Music to My Bones details call 402-651-9918 or visit http://www.bancroftstreetmarket.com.